The first bite yields tender and tasty meat with undertones of warm spice and fresh orange. It’s redolent of dusty streets and bright fruits, secret blue tiled courtyards and bustling souks. This is a Sunday roast that’s holidayed in exotic locations. Chicken is rarely better than when it’s roasted. And that usually calls for lemon and thyme, onions and black pepper. But sometimes, just sometimes you crave something a little different. Oranges are not all that different from lemons. A little sweeter, more aromatic perhaps. They lend a citrus tang and juicy warmth to any dish. Match them with a few warming spices and you’re heading firmly south to date palms and sandy shores of the north African coast, and the fine cooking of Morocco. Mixing sweet and savoury flavours, like dried fruit, honey and meat is typical of the region. The savoury sweetness of the fruity gravy adds depth, a pulsing rhythm to match the citrus melody of the orange. This is one for a cold dark winter Sunday when you need something to remind you of warmer times. For when you want to imagine the sun hanging high and bright in the sky, heat beating down on your head. 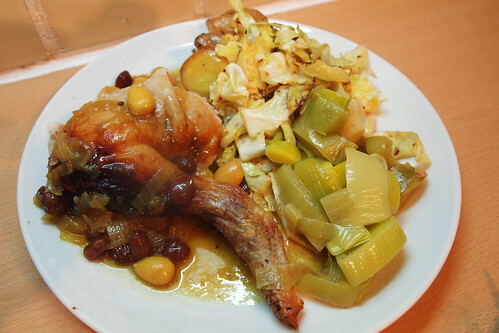 Like all roast chicken recipes, this one can be totally hacked, tweaked and changed to match your preference. Fancy something more European than North African? Try adding some chopped fresh rosemary instead of the Ras al hanut. Turn the oven on to 220oC and stick the chicken in an oven proof dish. Rub a little oil over the chicken. Then squeeze the juice of one half of the orange, drizzle over a little honey and sprinkle the ras al hanout over the chicken, in that order. 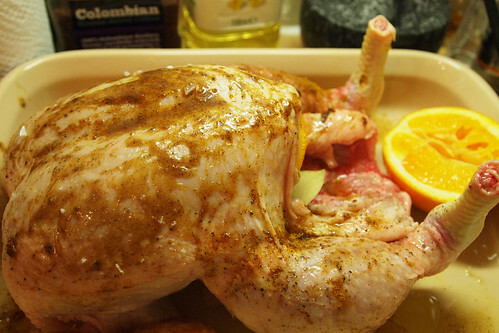 Cut the remaining orange half into quarters and shove it into the chicken. Scatter over some sea salt flakes and grind on some black pepper. 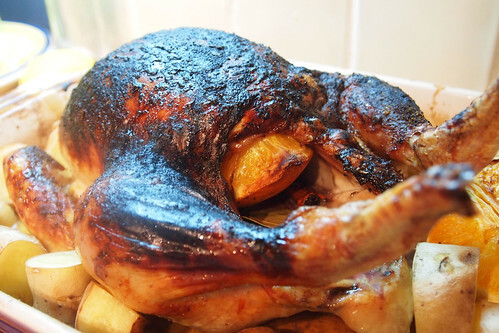 Then put the bird into the oven with a dish of spuds for 20 minutes. After that, turn the oven down to 160o or so and leave the chicken cooking for another 1 hour and 10-25 minutes (depending on the size of the bird). Test whether it is cooked (stick a knife in it’s thigh to the bone – the juices should run clear). If it is, take it out of the oven, cover with foil and leave for about 15 minutes to rest. Pour the juices into your gravy and put the spuds back in at 200oC to crisp up. While the bird is cooking start on the gravy. Heat the butter, with maybe a little oil, over the lowest heat. When it’s melted add the onions, stir and cover tightly. Leave to cook over that super low heat for 30-45 minutes. They should be meltingly soft after that. Add the rest of the ingredients, stir and simmer very slowly for another 30-45 minutes (until the chicken is done). love the sound of that gravy! what a great idea adding some extra fruity sweetness to a rich onion gravy. nom nom nom. @Melanie Seasons – how did it go?